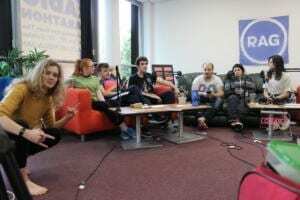 The 55-hours of continuous Live Stream and Radio Broadcasting enters its final stage, as 5 presenters along with their supporting staff see the light of Sunday from behind the windows of DUSA Hive. 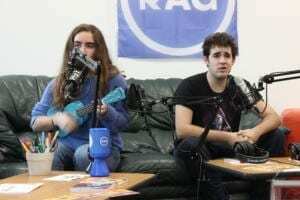 Jam Radio, with £1000 target, put on a Live Radio show from Friday 5pm until midnight on Sunday to raise money for RAG’s Charity of 2018/19, Dundee Foodbank. 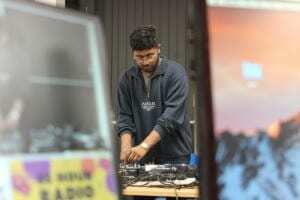 The show has welcomed student societies, hosted musicians and DJs, played games and chatted on topics ranging from student representation to sandwich preferences. Early hours of Sunday morning were lit up by both the aftermath of Kai Kaspar’s brilliant DJ set, but also by hitting the set target of raising £1000 in donations to Dundee Foodbank. Tireless, undefeatable, if a little numbed by the amount of energy drinks consumed, the students and two members of the Exec transitioned into the 2000s’ tunes, while interluding the Gaga-filled playlist with an extensive list of games to get through the last night. First thing, once fuelled by breakfast and lightning talks featuring last year’s Vice President of Representation, Alex Muir, the stage welcomes with open arms the bright smile and heart-warming voice of 3rd-year Biochemistry student Conchita Frangas. When not dueting with her brother who is part of this year’s Radio presenting team, Gonzalo, Conchita has started up her own photography enterprise, which we all agree you should definitely check out via this link! To emphasise the importance of student opportunities available on campus, we follow the layout of previous days and interview multiple societies, including OpSoc, Sign Society or Singapore Society, providing them with the chance to tell us about what they do and how all students can get involved with them. Music tunes for today roll onto the first two decades of our century, and the rest of the programme features more games, talks, and the work of poet Andy Jackson. When speaking to the survivors of marathon presenting, they all agreed that despite feeling exhausted and in dire need of a shower, the experience, highlighted by the motivation in the good cause, had been “well worth it”. Text JAMR55 followed by the amount you’d like to donate to 70070 (i.e. “JAMR55 £10” to donate £10) – ANY amount goes a long way and will be HUGELY appreciated!